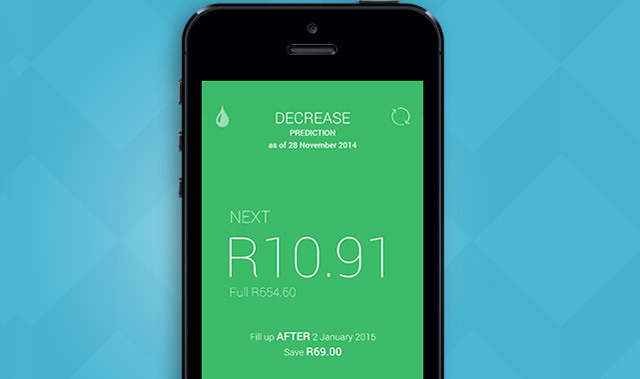 A new, South African-developed smartphone application tells you when to fill up your car and how much it’s going to cost you, with the idea that it will save consumers money. The app, called FillApp – and developed by a company called TouchFoundry – uses information available on agency and government websites to predict changes to the fuel price. Indeed, on Friday the energy department announced that the price of all grades of petrol will drop by 93c/l next week. The price of diesel will decrease by R1,02/l. Co-creator Lance Jenkin says there is a lot of publicly accessible information that isn’t easily available to the public. “Ordinary people aren’t able to access this data efficiently and conveniently when they need to. So we did the time, crunched the code and came out with an elegant product that will hopefully add a touch of convenience to everyone’s lives,” Jenkin says in a statement. Once FillApp knows the size of a user’s fuel tank and what fuel they use, it will send a reminder each month informing them of the fuel price change, how much they’ll save and whether they should fill up before or after the change – depending, of course, if it’s a price increase or decrease. “The aim here was to develop something simple, intuitive and unobtrusive,” says co-creator Fabio Longano. Downloaded the app message popped up “Unfortunately, FillApp: SA Fuel Alerts has stopped.” Another hoax app?